When it comes to urban cycling, safety is of the utmost importance. Navigating a major city on two wheels and getting home in one piece gets even harder in bad weather and when you’re riding in the dark. In these situations it’s important to have a bright front and back bike light so drivers will see you no matter what. Most bike lights are small and dull compared to other lights on the road, but Orfos is in the process of making some of the brightest lights out there. 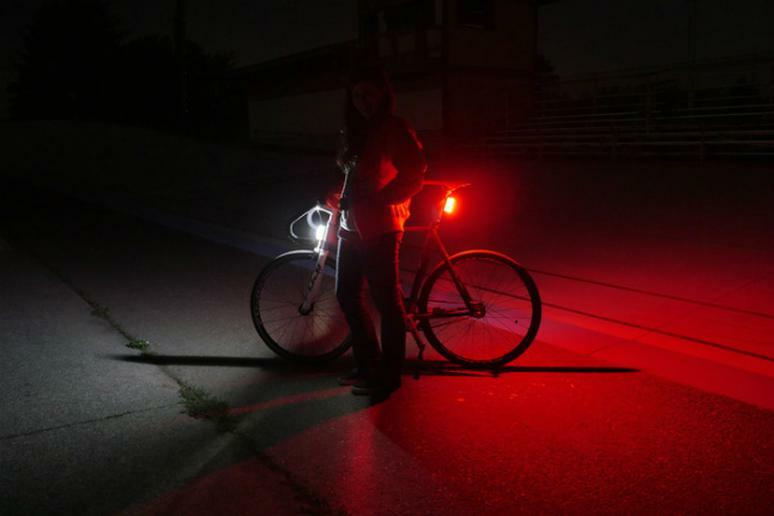 The lights, called Orfos Flares, have 360 degree visibility and brightness comparable to car headlights and taillights. The impressive brightness utilizes a total of nine of the most effective half watt LEDs that around. The RED Flare is a total of 300 Lumens and the WHITE Flare is a total of 500 Lumens. The Orfos Flares are completely encapsulated so they are safe from the elements. The makers injected a silicone into the light encasement in order for it to fill any gaps and to eliminate any air. This protects everything internally so there is no way any water will get into the light. The lights were even tested 50 feet underwater for one hour and they held up with the dive team. Orfos Flares has a magnetic mounting feature. The magnets are made from N52 neodymium, in other words—the strongest magnet there is. The magnets will remain on your bike no matter what terrain you ride, but you will also be able to remove the magnets from your bike easily. The Orfos Flare has a USB port, which allows you to charge your lights anywhere and get up to 24 hours of life from the battery. They also have four different light patterns: solid, pulse, blink and hyper and three different brightness levels with each pattern. The Orfos Flares have an open campaign on Kickstarter and have been fully funded, more than five times over. You can preorder the RED or WHITE Flare on Kickstarter for $119 a piece or get both for $229.